Differently form iOS, Android lacks an initial splash bitmap, but you can build one to improve startup time (or its perception). Differently from iOS, Android lacks an initial splash bitmap, but you can build one to improve startup time (or its perception). In fact, it is not that you can make things faster, but the user will get the initial screen in a shorter time than he or she will get the main form, if this takes time to initialize. You'd want to do this when the main form has many controls, requires database or file access, needs to load images, access to remote data, or anything that takes extra time. In all of these scenarios, an initial splash screen (like the one I've used in my Play Store app covered on log.marcocantu.com/blog/my_son_first_play_store_app.html) will be handy. There are two approaches I can think of. One would be an initial screen that is never displayed again, the second would be a splash screen that acts as main menu for the application, and can be used over time. For my app, I implemented the second approach, and this is what I'm going to cover. Also, in my specific case, there are two alternative secondary forms you can go to from the main splash screen form. There are two buttons at the bottom. To make them half of the screen each, I added them to a GridPanelLayout with a single row and two columns, using 50% of the width each. The two buttons are aligned to the area of each of the two cells. As you can see, when the timer fires the app creates the two secondary forms (which takes a few seconds on my phone, as the program loads 60 or so images from files) and enables the two buttons. This delay and the actual initialization of the real mani form takes place while the splash screen is visible. Without this trick, the user will have a black screen... and the Android system might also indicate the app is not responding and refuse to start it. Needless to say you'll have to adapt this splash screen code to your specific scenario, but I think it is worth using this approach in any application with a non trivial initialization. 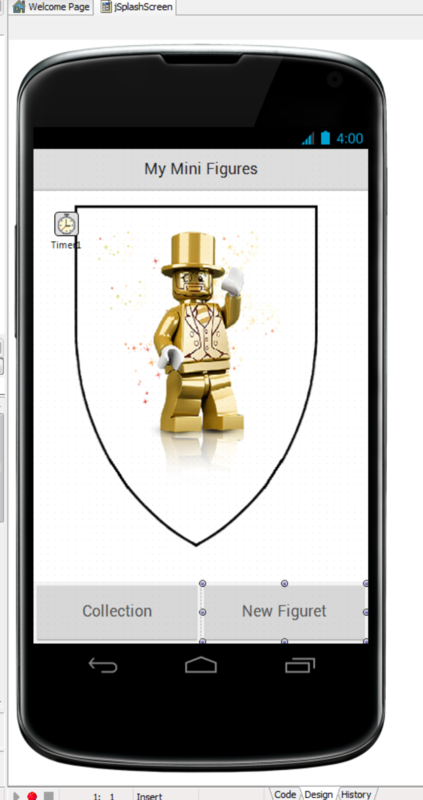 Again, you can test this in action by getting the app from the Play Store at https://play.google.com/store/apps/details?id=com.marcocantu.MyMiniFigures. enabled := true at designtime? executed a second time before the first is done. I enable it at design time, but setting it in OnCreate will be identical. Second video on his page, at about 30 minutes. soon as loading of splash screen is finished. something very usefull here for example. Main Thread (the VCL thread). I reenter in the procedure after the anonymous timer. an image when the app starts - just like iOS. is using your app for the first time. the Fill is of different color. starts the same 4-5 seconds on my Galaxy Note 2.
very fast. What is the reason? reach less then 4 sec on Galaxy S3. reach 2 sec as demo app. First of all: Huge fan! I own many of your Delphi books. I tried your trick with the time and it semi-works. have done something wrong maybe?